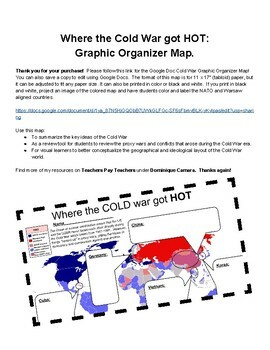 In this graphic organizer map, students can summarize the major proxy wars and world Conflicts of the Cold War Era. Teachers can also edit the map by saving the Google Doc and double-clicking on the image. This graphic organizer is set up to be use a large 11 x 17" paper, but can be reduced to any paper size.